Stylish and sharp, add these contemporary tables to your living space to create an atmosphere of tasteful sophistication. With a thin-line aesthetic reminiscent of a bridge truss base, the display emulates a polished modern architectural appearance. In a trendy mixture combining round elements from the table top and the angular elements of the supports, a transitional appearance is added to the multi-faceted style. 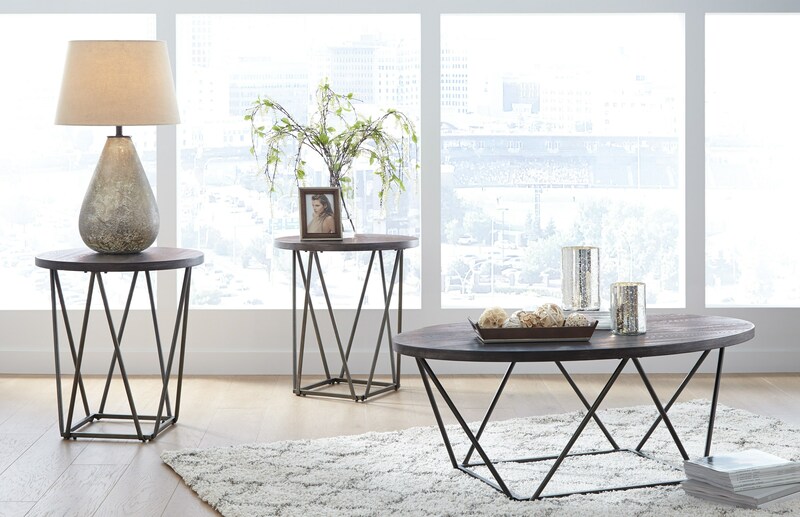 The Neimhurst Contemporary Round Occasional Table Group with Metal Legs by Signature Design by Ashley at Value City Furniture in the New Jersey, NJ, Staten Island, Hoboken area. Product availability may vary. Contact us for the most current availability on this product.